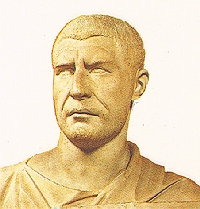 Marcus Julius Philippus was born in Arabia the son of Julius Marinus. Philip entered a military career and was on the campaign in 243 AD against the Persians led by Shapur. Timisitheus was the Praetorian Commander in charge and he successfully defeated the Persians at Rhesaina. However, Timisitheus suddenly became ill and died during the campaign. Philip I the rose to the rank of Praetorian Commander under Gordian III. Philip was more interested in taking the throne than in destroying the Persians. Philip’s intentions were clear. Her instigated whatever he could to create disloyalty among the troops against the 19-year-old emperor Gordian III. In a last and sad attempt to maintain locality, Gordian III addressed his troops. He finally told his men to chose between himself and Philip. He gamble failed and the troops openly selected Philip and Gordian III was murdered. Despite a monument being raised to Gordian III on the spot that he died, and his body being taken back to Rome for burial, Philip never looked back. Philip was eager to take the reigns of power in Rome so much so that he quickly agreed to a peace treaty with the Persian king Shapur. The terms were widely viewed as a sign of defeat on the part of the Romans. Philip gave Shapur a down-payment of 500,000 denarii in addition to an annual indemnity. No Roman emperor had ever agreed to such a deal, but Philip was more interested in getting to Rome. Philip raised his 5 or 6 year-old son, Philip II, to the rank of Caesar and gave the title of Augusta to his wife Otacilia Severa. Upon being recognized by the Senate, Philip quickly found himself involved in defending the northern frontier against the Carpi on the Danube. Philip was at least successful this time perhaps after tasting the power at Rome he so much desired. Philip did order some public works to be built including a reservoir. However, the highlight of his reign was none other than the 1000th year anniversary of the founding of Rome. Philip ordered spectacular games to be held between April 21st and 23rd during the year 248 AD. He also struck a series of coins to denoted the occasion. Time was running out for Philip. His bold grab of power by a commander perhaps sparked similar dreams in the minds of others. The first to rebel was Pacatianus in 248 AD who was commander in Pannonia and Moesia. Philip was lucky in this case since the usurper was murdered by his own troops. The second usurper to appear in the East – Jotapianus. This rebellion appeared to be caused by high taxation imposed in Syria by Priscus who some claimed was Philip’s brother. Jotapianus was also murdered by his own men but the uprising continued into 249 AD. A third usurper appeared on the Rhine about this time known only from a single coin in the British Museum – Silbannacus. Yet another usurper appeared on the Danube by the name of Sponsianus. Most likely these men also met a similar fate as Jotapianus and Pacatianus. With all these uprising in the north, Philip made his fatal mistake. He dispatched Trajan Decius and appointed him governor of the provinces of Moesia and Pannonia. This gave Decius control over several legions. The Goths posed a serious threat to the north and Decius marched against them victoriously. The troops then hailed Decius emperor. The numerous uprising showed their dissatisfaction with Philip “the Arab”. Decius then marched on Rome and in the September/October the two armies met in Macedonia. Philip was defeated and died in battle. Upon hearing the news in Rome, Philip’s son was immediately murdered and Trajan Decius inherited the throne. The reign of Philip I marked the true collapse of the denarius as a regular issue within the monetary system. 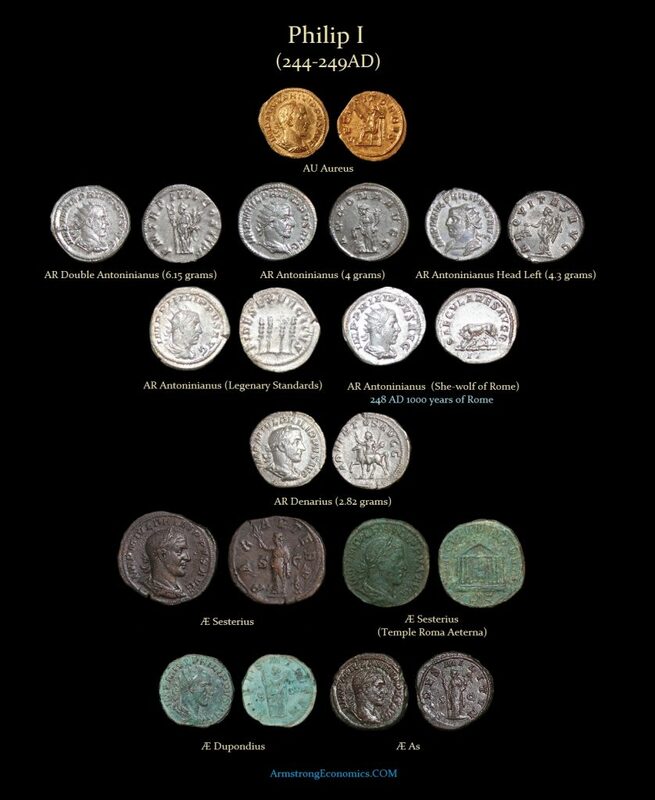 As inflation soared, the denarius no longer became a viable denomination and it was virtually replaced by the antoninianus. All subsequent reigns that followed Philip I issued denarii very sparingly if at all.